In some cases, a full-mouth rejuvenation is necessary to create the smile you desire. 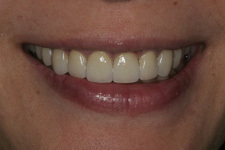 These full smile makeovers can involve a variety of these cosmetic techniques: porcelain veneers, crowns, composite bonding, cosmetic tooth whitening, dental implants or bridges. After a comprehensive examination of your mouth, Dr. Xu will talk to you about your options and help you make the best decision for your smile. 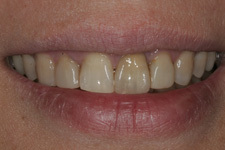 The following are the before and after photos of smile makeover, using lava crowns combined with porcelain veneers.